Can you post that in a real .png A8 size? It was a quick conversion made for the photo on real hardware. Thanks to A8 smaller borders, the result is very nice. Unfortunately the background doesn't match original perfectly, therefore I didn't release PNG and XEX as usual. Rastaconverter seems unable to make a perfect conversion of the background. Perhaps G2F would give better results. 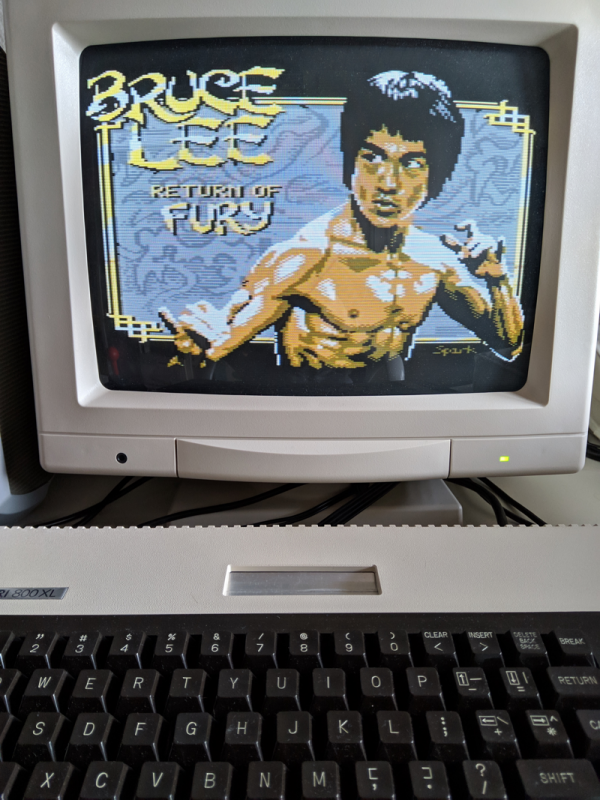 Therefore, here is the original C64 image I exctracted and cropped. Right, had a chin wag with DMX, the author of the new C64 version and here's what he had to say, I have his permission to post this and invites thoughts from any would be devs.. I'm currently playing the Atari version of Bruce. It's interesting to see what differences there are! They feel so similar, yet so different, that it's strange they're done by the same coder. How about this: Can anyone in Atari Age produce a disassembly of the Atari game, that also can be reassembled into the original, testable, binary? Because I'd be willing to label it for you with what I've got. I can also provide the new ROF maps (done in Tiled) and map packing tool after this. Edited by _The Doctor__, Thu Mar 7, 2019 8:41 AM. Either something will happen or not...That's as close as I get.. Here is a version I converted from the original VAPI ATX, with minimal intrusiveness, just copy protections removed, and slight rearranging of some code so it could compile in to a smaller xex. This can be reassembled with MADS(2.0.4 b7)or later. I have a version that is a bit more commented, but hopefully he can give some details on this non commented version and we can fill in the blanks from there. Info passed on to Dmx...The ball is rolling....I can only hope..
Hopefully he can give us a lot of useful information. At the very least his new maps and map packing tool would be very interesting to have. Edited by Ute, Fri Mar 8, 2019 5:12 PM. Well an updated commented source will be on its way back from Dmx tonight for you guys, I've not asked for the maps as yet because there's no in the open dev interest so far which I hope will change unless you are keen Ute? Edited by Mclaneinc, Sat Mar 9, 2019 10:17 AM. Thanks for all your efforts! 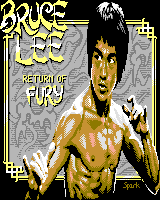 So that source, that's for the original Bruce Lee, and he's just commented on it, or that's a sort of Atari version of his Return of Fury, as in he's pasted in his updates fpr Fury into the priginal BL disassembly ? NP, just trying to get a nice update on our machine too with the help of Dmx.. Taking a look and checking to see if it compiles. Thanks for all of your efforts Paul. Edited by Ute, Sat Mar 9, 2019 3:45 PM. Just a couple of tweaks and it's compiling. Didn't play test all the way through. Has a lot of good info. Fills in a bunch of gaps from my other commented file. I have attached the compiling DMX version and also my own commented version. I'll use Winmerge and try to get a nice working file going. Edit:Adding the caveat; My comments may not be %100 correct, especially any comment ending with a question mark. Edit 2: Awesome effort Paul, much appreciation to you! Edit 3: Gratitude to DMX as well! Edited by Ute, Sat Mar 9, 2019 4:53 PM. So the differences between the DMX and the BruceComments, would some of those be because DMX's version has had changes made to it, like it talks about relocating some of the code to make it smaller for the xex, whereas the BruceComments version represents the disassembly of the original Bruce Lee with no changes ? Or is the Comments version a disassembly of the the exact same code as the DMX version ? Just trying to be clear about what we're seeing in each one. As far as producing Fury, even if a few people help, it's going to need an individual to work pretty solid at it for a few months I'd guess to come up with a new version. Seems like the few people here who might try it are already busy, I dunno. Ute, are you going to give it a try ? Edit: Very nice commenting in the BruceComments. Really. Edited by Alfred, Sat Mar 9, 2019 5:11 PM. I spoke to Dmx again and the maps would need to be redone as graphics res etc are different, they would be more of a guide unless one of our artists wanted to redraw them? As for thanking me, no need, I'm just trying to see something happen but it needs the brains of you guys for that to happen. not into sidescrollers today but i enjoyed things like galahad and the holy grail and of course Adventure back then (and still today) and I liked that this was sort of adventurish in that there were quite a few different screens and tasks.. always enjoyed karateka and conan for the same reasons... I need to play this again..
BruceComments and DMX are the same version just commented differently. Both from a version I converted from ATX -> ATR and then from ATR -> XEX. The ATR version is nearly identical to the ATX version with protections removed. For the XEX I had to make a few space choices. But the engine is still using Ron's original work and nothing is functionally different, just some jumps and labels relocated in memory, and of course there is no loading in between screens. I am willing to give it a try time permitting. Something I always thought would be fun as a kid would be to have a level editor for Bruce Lee, like there were for other games(Boulderdash, Loderunner, etc). There are issues I noted on an earlier post, such as the engine is tightly coupled with the lamp table, which means the original code will have to change. Unless we want for example, screen 12 lamps always to be tied to some function happening on screen 4. (I hope that makes sense, I'm crap at explaining things sometimes) But this all sounds fun to me. I'm flexible as far as what direction we go. We could do a fairly accurate ROF, or something else. Technically while were cracking it open we can do anything we want: Colors, character shapes, music. I'm open to whatever. One thing I would like to come away with at the end of all this would be a nice level editor. This is all sounding rather positive and I'm very grateful for your work in this. I'll chat with dmx (he does read the thread though) and see if I can get the tiles for you to look at. Oh, don't forget that we already have Omnivore as a PC util to edit levels but if you want as a personal like to do one then amazing. Thank you to you and to all for the interest in this idea..